Lost or misplaced your Blaupunkt Active keycard? Some Blaupunkt Stereos use a Keycard for their security and they look a little bit like a credit card with a smart chip on them. 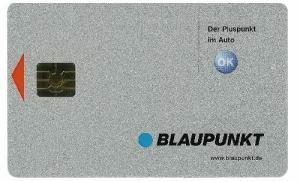 If you have lost or misplaced your Blaupunkt Active keycard, then we can supply the unique Master Code for you stereo so that you can then reprogram a brand new card for use. If you are hesitant about doing this yourself, then you can send the stereo to us for programming, but it really is a very easy thing to do yourself. When our Instant Code services are used, they also come with a set of instructions and aftersales assistance should you need it. This entry was posted in blaupunkt, car radio code news by ecom.